The whole family dressed up! 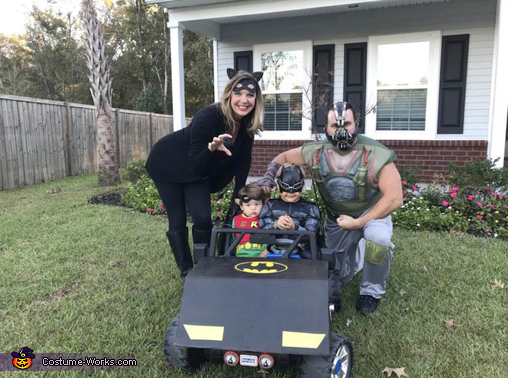 My wife, kids and I dressed up as Batman, Robin, Catwoman and of course the villain Bane from The Dark Knight Rises. We made a customized power wheels Bat Mobile wrap for our sons Jeep. Cut out cardboard to fit each side and spraypainted it black. Zip ties and duct tape held it together. Printed out various sized Batman decals for it and even cut out red Dixie cups and hot glued them to the back for lights! Our boys loved it and we probably got over a hundred great comments on it during trick or treating! We were the hit of the neighborhood!